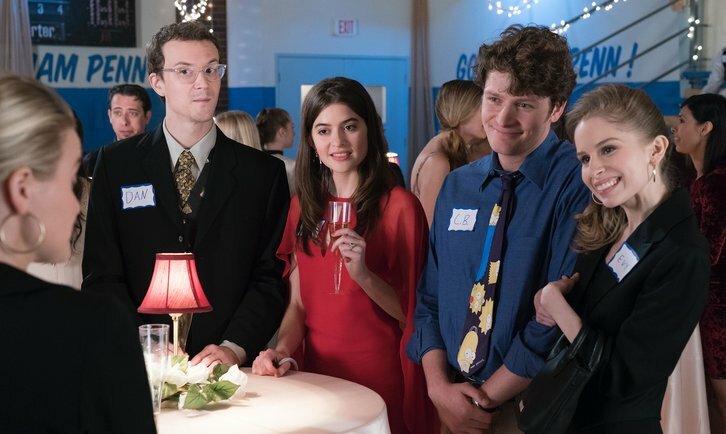 "Lainey and Erica's High School Reunion" - When her high school reunion is held at William Penn, Lainey tries to hide her teaching job from old classmates, pulling a "Romy and Michele" lie with the help of Erica Goldberg (Hayley Orrantia) and CB. Meanwhile, Mellor's distraught to learn his star athlete alum, Ruben Amaro Jr. (Niko Guardado), sees Glascott as more of a mentor than Mellor on "Schooled," airing WEDNESDAY, FEB. 27 (8:30-9:00 p.m. EST), on The ABC Television Network, streaming and on demand. Guest starring is Hayley Orrantia as Erica Goldberg, Alex Jennings as Carla, Allie Grant as Evy Silver, Niko Guardado as Ruben Amaro Jr., Nate Hartley as Dan, Sean Marquette as Johnny Atkins, Christian Gehring as Roxborough Ronnie, Gabe Gibbs as Weasel, Gabriela Quezada Bloomgarden as Rosa, Israel Johnson as Ed, Blake Bergman as Griff, Jordan Austin Smith as Mike and Ruben Amaro Jr as Himself. "Lainey and Erica's High School Reunion" was written by Adam F. Goldberg & Chris Bishop & Matt Edsall & Jimmy Mosqueda, from a story by Vanessa Mancos, and directed by David Katzenberg.